This gooseneck holder, also called lazy holder, is suitable for both tablets and cell phones, totally frees your hands and enable you to pose comfortably looking at your phone. 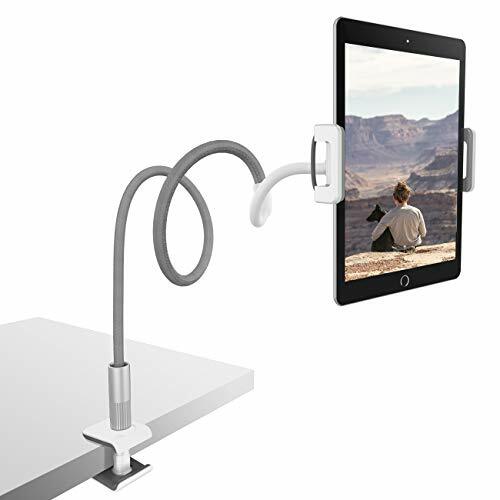 360 degree full adjustable tablets cradle stand for iPad, iPhone, such as iPad 9.7 2018 / 2017, iPad Pro 9.7 10.5, iPad mini 2 / 3 / 4, iPad air 2, iPad air, iPad 6th 5th 4th 3th generation, iPhone 6, iPhone 6s, iPhone 6 plus, iPhone 6s plus, iPhone 7, iPhone 7 Plus, iPhone 8, iPhone 8 Plus, iPhone X, iPhone XS, iPhone XR, iPhone XS Max. Provide great convenience for reading, work well with fire 7, fire HD 8, fire HD 10. Use this Gooseneck tablet mount in the kitchen to follow a recipe while cooking, protect your tablet from being stained and view at best angle. In the nightstand, enjoy a TV series or a movies while lying on bed. For a switch owner, enjoy your switch games wherever the edge of table is less than 2.7 inches. 【Broad Compatibility】 Compatible with all 4- 10.5 inch cell phones and tablets, such as iPad mini 2 3 4, iPad pro 9.7 10.5, iPad 6th 5th 4th 3th Gen, iPhone XS Max XR X 8 8 plus 7 7 plus 6 6s plus, Google Nexus, E-reader, Fire 7 / Fire HD 8 / 10 Tablet, Nintendo Switch. Notice: This lazy mount does not fit thick cases. Please make sure the thickness of your device is no more than 13 mm. 【Easy to Position】The rough PU skin increases the friction between hands and hose, making it easy to twist. The inside of arm is made of premium aluminum alloy, which greatly helps in reducing wobbles. 【Good for Reading and Viewing】Enjoy a great book or movie with this tablet stand, totally free your hands so you can lie comfortably on bed or sofa. Notice: Due to its flexible structure, there are wobbles while typing on the tablet. 【Protect Eyesight and Reduce Neck Strain】With this lazy bracket, you can keep your tablet at appropriate distance from your eyes. And also ergonomically fix your posture while looking at the tablet. 【Worry-free Purchase】 All Lamicall products are backed by 12-month guarantee. If you are not satisfied with your purchase, just feel free to contact us. Our friendly customer support will find a best solution for you.